It was sometime around 1976/77 that I found a UHF television station that had a huge block of cartoons that ran for good five hour block on Sunday afternoons. 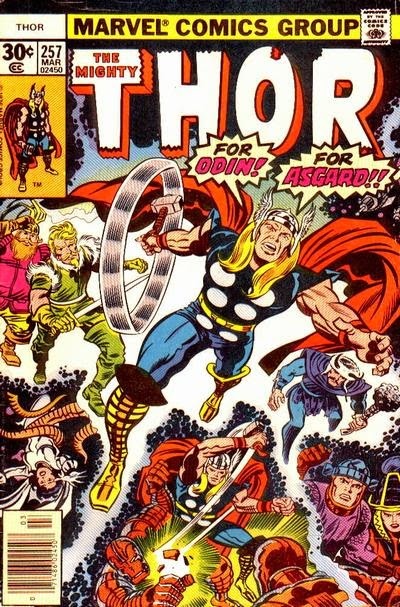 Rocky & Bullwinkle, Dudley Do Right, Underdog, George of the Jungle, The Archies, The Beatles and all of the the Marvel cartoons from the sixties and this where I discovered the Prince of Asgard, Thor Odinson, the God of Thunder and Defender of Midgard and the Realm Eternal. I have to be honest, for the most part, I got my fill of Thor through the pages of the Avengers. Until I could buy my own comics, I had to depend on my parents so instead of buying issues of Captain America, Iron Man and Thor, I would pick out the Avengers where you could get all three characters in one book. I did grab issues of Thor from time to time though. For a kid in love with superheroes and fantasy, reading Thor was a no-brainer. I got my first issue of Thor as part of a reward for learning how to read. Because he was associated with the Avengers, the book fell under my mom's radar during the time she thought anything fantasy related was the work of the devil. 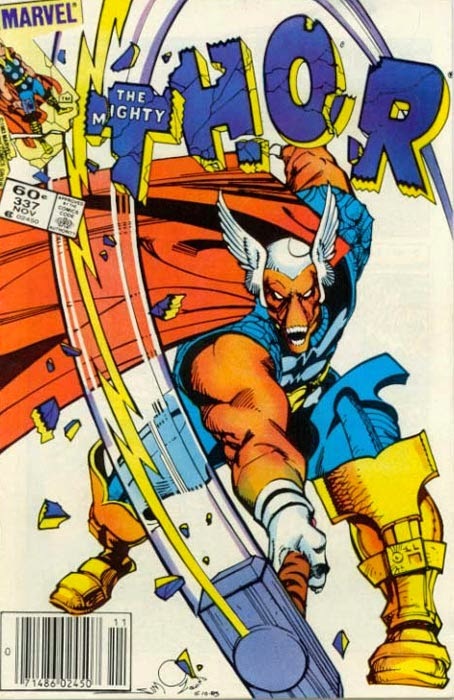 It wasn't until Walt Simonson started his legendary run on the book that I really started getting into the character. I've talked about my admiration for Walt's run here and I'm not going rehash all of that again. I'll just say if there were any one run of Thor that you have to read, Walt's run is it. Where Conan was the king of fantasy comics, Thor was in a league all of his own. Not only was he taking down major threats alongside the Avengers, but he was crossing the cosmos, jumping dimensions and fantasy realms; taking on demons, trolls, giants and cosmic threats of all shapes and sizes one day and putting a stop the Masters of Evil or the Wrecking Crew the next. Thor's supporting cast and rogue's gallery just made everything better and any issues of the Avengers or Thor that had the Black Knight and Thor together was a bonus. After Walt's run on the books, everything that followed just seemed to pale in comparison. When the 90's came along, I couldn't read anything Marvel was putting out and I'm not going to rant on that. It wouldn't be until Kieron Gillen got his run on Thor that I returned to reading the book. I was glad to see the God of Thunder in the capable hands of Kieron, Matt Fraction and Jason Aaron. Speaking of Jason Aaron and his work on Thor thus far, it is nothing short of amazing. Last night I read the first ten issues in one sitting, again. It is because of this that I have faith in Jason being able to make the Tenth Realm a good story even though I completely dislike the idea of it. When it comes to my absolute favorite hero, it always comes down to three people; Spider-Man, Captain America and Thor. I could give you a different answer each time you asked me, but it's always one of those three. If you're a Thor fan, it's easy to see why, he is the superhero of superheroes. Thor has always been a personal favorite of mine, although I never really collected any of his solo titles. It was a shame that Marvel killed off him and the Asgadians back when Marvel turned into a stinky pile of carp. I was truly surprised that they resurrected him at all.